FILE - Sen. John McCain, R-Ariz., delivers remarks at the U.S. Naval Academy in Annapolis, Maryland, Oct. 30, 2017. At a time when the norms of American political discourse are being rewritten and some democratic institutions are undergoing a stress test, Republican Senator John McCain's absence is keenly felt on Capitol Hill and beyond, fellow senators across the political spectrum told VOA. "We miss him terribly," independent Angus King of Maine said. "His voice is so clear and so well-grounded. He's the conscience of the nation right now." "We miss his leadership," North Carolina Republican Thom Tillis said. "If you think about Senator McCain — his independence, his historic maverick stance — he stretches everybody's thinking." "He is a force of conviction and conscience," Democrat Richard Blumenthal of Connecticut said, adding that McCain is particularly needed on matters pertaining to Russia. "The president's [Donald Trump's] abject failure to defend our national security interests against the Russians — John McCain's voice would carry such weight. He is just a force of nature when it comes to our national defense and security," Blumenthal said. FILE - Sen. John McCain, R-Ariz., left, and Defense Secretary James Mattis speak to reporters after their meeting on Capitol Hill in Washington, Oct. 20, 2017. McCain, who has represented Arizona in the Senate since 1987, has been absent since December while receiving treatment for brain cancer. His office is not predicting when or whether he might return. Known for fiery floor speeches, McCain's public communication in recent months has come via Twitter. He recently defended Robert Mueller, the special counsel in the Russia probe, and blasted Trump's outreach to his Russian counterpart. "An American president does not lead the Free World by congratulating dictators on winning sham elections. And by doing so with [Russian President] Vladimir Putin, President Trump insulted every Russian citizen who was denied the right to vote in a free and fair election," McCain tweeted. Such statements earn particular praise from Senate Democrats. "We're grappling with whether we cozy up to a foreign adversary," Virginia Democrat Tim Kaine said. "He has a gravitas that is in short supply. The Senate could use more John McCains, not fewer." Republicans are more apt to laud McCain's leadership on national defense as chairman of the Senate Armed Services Committee. "During Senate debates, like earlier this week on our role in Yemen, he ordinarily would be in the thick of that," the Senate's No. 2 Republican, John Cornyn of Texas, said. "These days it seems like the loudest voice is the one people listen to. John McCain has credibility because of his experience and his passion for national security that very few people can compete with." Oklahoma Republican James Inhofe has led the Armed Services Committee in McCain's absence and is the first to acknowledge he has big shoes to fill, taking over from a man who fought in the Vietnam War, endured more than five years as a prisoner of war, and rose to become his party's presidential nominee in 2008. 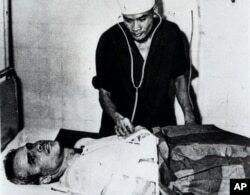 FILE - John McCain is administered to in a Hanoi hospital as a prisoner of war in the fall of 1967. "There is no one [currently serving in the Senate] who has a background like he has," Inhofe said. "There is something about the sacrifices he has made that sets him apart and beyond the rest of us. I know the things he went through that I didn't go through." Without McCain, the Republican Party's 51-seat Senate majority has effectively been reduced to 50 in the 100-member chamber. But sources close to Majority Leader Mitch McConnell of Kentucky noted that missing a member has not altered the outcome of any major vote so far this year. "One senator's absence on our side is not affecting our workload on any of the issues," a McConnell aide said. McCain's votes have been but one element of his impact on Capitol Hill, according to senators of both parties. "It goes beyond his vote," Tillis said. "If you listen to him, sometimes you change your mind. Every once in a while, you try to change his, but I think he's got a higher score [in changing minds]." 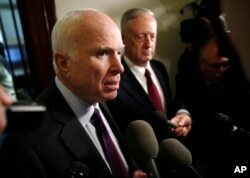 "John McCain calls it the way he sees it. He has a strong moral compass and a real love for this country," Maryland Democrat Ben Cardin said. "We disagree on a lot of issues, and we agree on a lot of issues. Great leader and a person you could always rely upon to stand by what's right for our country. Not what's popular, but what's right." Medical experts say the prognosis is grim for the aggressive form of brain cancer McCain is battling — something many of his colleagues in the Senate find difficult to acknowledge. "I just wish he were here. I'm still counting on seeing him again here," Blumenthal said. "He's a fighter. I hold out hope that he'll be back strong as ever," Cardin said. On March 18, McCain's daughter, Meghan McCain, tweeted what appears to be the most recent photo of her father.